This lab is meant to serve as a docker/containers 101 lab course. The objective of this lab will be to walk through a step by step exercise to help a user new to docker to get a docker image built, pushed to a registry, and deployed on a single non clustered standalone docker host. As an alternative to installing the pre-requisites below, you could build an ec2-linux instance with all of the requirements bundled in. See the bottom of this page in the Resources section for a packer file that will create a lab builder AMI. The first thing that we will need to complete this lab will be to have a local docker environment running. This can be accomplished by either installing Docker for Mac, Docker for Windows, or the Docker engine installed on Linux. You will need to have an active AWS account, as this lab will cover pushing to an ECR (Elastic Container Registry), as well as deploying docker to an EC2 (Elastic Compute Cloud) instance. You will need an IAM user created with a miniumum of EC2 and ECR permissions setup. The user should have programmatic access, and have a generated Access Key, and associated Access Secret Key. You will need to have python and PIP (Pip Installs Packages) installed on your workstation so we can download and install the AWS CLI tools. This step will be required for obtaining ECR login credentials further down the tutorial. If your using windows, then you will need to have PuTTY and PuTTYGen installed on your local windows instance. We will need PuTTY in order to SSH to our docker instances, and PuTTYGen in order to convert the AWS Key PEM file to a PuTTY formatted PPK File. Follow the steps outlined in Managing Windows SSH Keys with PuTTY to convert the AWS PEM file to a PuTTY PPK formatted KeyPair. Provision an instance to run docker. The instance should have a security group that has SSH (port 22) and tcp port 8080 open. 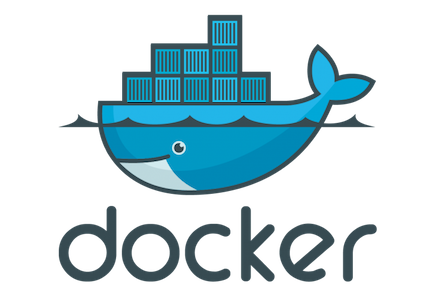 You can build a docker instance by simply launching your favorite Linux distribution and using the built in package repository to install docker. Now that we have Docker installed, we need to set Docker to start on boot. Open your favorite editor and create a file named Dockerfile. This file will contain a list of all instructions that are required to install your application and build a container image. Copy the following Dockerfile content into your Dockerfile to build a Jenkins container image build. Note that if your using a remote EC2 instance, then you will need to use vim Dockerfile and paste the content of the dockerfile below using ctl+p, then close the file using esc, :wq! Once the Dockerfile has been saved, you can use it to build a docker image that can be deployed to any environment. We will use the -t flag in the docker build statement to specify an initial tag for the image. docker build -t lab/jenkins:latest . The docker build statement should be ran from the same directory where the Dockerfile was saved. The " . " at the end of the build statement is required, as it tells the Docker daemon to look in the current directory for a file named Dockerfile. The container will go through each step from the dockerfile being executed while the image is being built, and will display any console output generated from each step. When the image has been built successfully, Verify and Run the image. 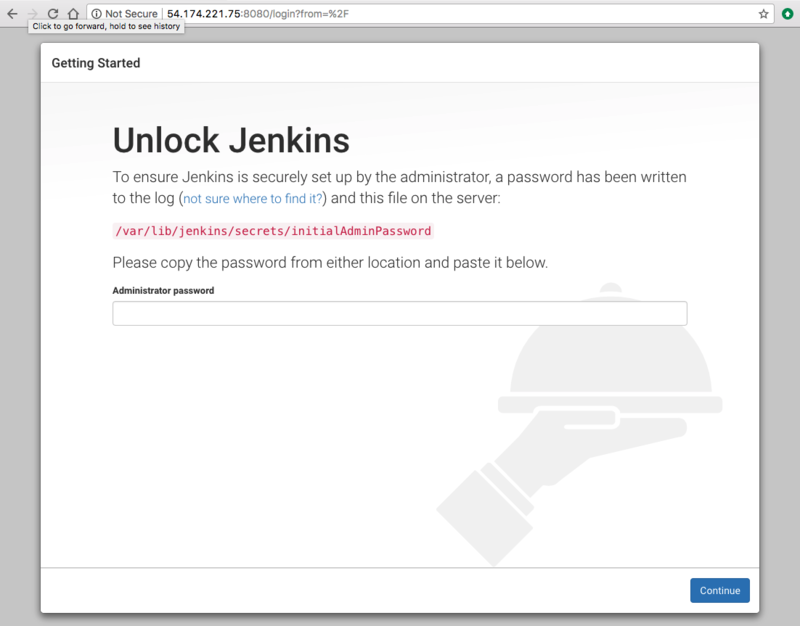 Once it's been ran, we can test its proper functionality by loading Jenkins in a browser. -it runs the container with an interactive tty. --name will set the container name. -h sets the hostname of the container. -d will launch the container in daemon mode. Without it, the container would launch, and put you directly into the shell. If you are put into the docker container shell, you can exit by pressing CTL P + CTL Q. Once the container has been launched open a web browser and go to the host bound port of 8080. The container build is successful if Jenkins loads properly in the browser. After Jenkins has been successfully launched in the browser we can now clean up the running container. We use the docker stop command to stop the running instance, then use docker rm to remove the running instance. Neither of these actions affect the image that we created, only the running instance of that image on our local machine. Once the running instance has been stopped and removed, we can push our tested image to the repository for future deployment. From the top left side of the navigational menu bar, click on the Services menu, and then choose Systems Manager by either navigating to the section of the listed services, or by typing the first few letters of the service name in the search box, and then choosing it from the filtered list. If you have never used ECS or ECR previously, you will be presented with the Getting Started page. Click the button. 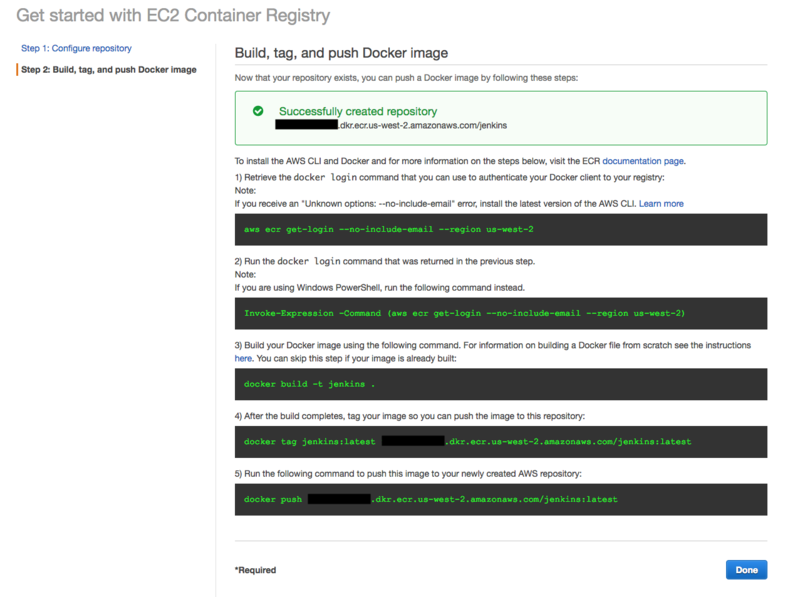 On the Getting Started screen, Uncheck the Deploy a sample application onto an Amazon ECS Cluster leaving only the Store container images securely with Amazon ECR option checked, and then press Continue. Next we will need to name the registry. Type the name of your repository in the Repository Name field and then press Next Step. Use only lower case letters and no special symbols in the container registry naming convention. Last we will be presented with the information on how to log in and interact with our repository. Read through the instructions, and press the Done button once done. If you need to see the instructions again in the future, you can do so by going to the registry in the ECR Repositories section of the console, selecting the repository, and clicking the View Push Commands button at the top of the repository view window. The above command references the us-west-2 region. Ensure that the region reflects the proper region where you created your repository. On your workstation, use the returned command response to log into your docker repository. Tag the image with the repository name given in the ECR command list. This will allow us to push the image to the newly created ECR repository. An image tag consists of 3 components, the server location, repository name, and image build. In the case of this example the repository name of 123456789012.dkr.ecr.us-west-2.amazonaws.com/jenkins:latest breaks down telling the docker dameon to push the image to the server DNS name of 123456789012.dkr.ecr.us-west-2.amazonaws.com, using the jenkins repository, and flag it as the latest build. Ensure when using the docker tag, and docker push statements that you replace the images tagged name, with the proper tag name from your own docker repository. The examples below reference the image and repository used during the creation of this lab, and are not valid tag or repository names. Now that we have both the Docker image and repository created, and are logged into the repository, we can now push the image to the repository. Once the image has been successfully pushed to the registry, we can verify it by going to the ECS/ECR console. This next section will cover deploying the docker image to a standalone Docker host, running on an Amazon EC2 Instance. SSH into your host, and ensure that Docker is running properly by issuing a docker info command. The authenticity of host '1.2.3.4 (1.2.3.4)' can't be established. ECDSA key fingerprint is SHA256:aaYjORsif3hmdbIHEBepYaQcvebOvEG+QJ3oHZzJZJo. Warning: Permanently added '1.2.3.4' (ECDSA) to the list of known hosts. Next we need to use the docker login command previously obtained to log into the ECR registry from our new docker host. This will allow us access to the image that we built and pushed in the previous section of the lab. Once logged into ECR, we can now run the new image that we created earlier. There are 2 ways to get the image onto the new deployment host, The first would be to do a docker pull, which would simply pull the image down to the host, requiring a second docker run command to actually run it. With Docker however, the first step isn't required if we are running the image for the first time. Simply using the docker run command will perform both steps automatically. Once the run has completed, we can test the deployment by opening a browser and going to the IP of the instance on port 8080. The Jenkins screen should appear.